With many children in the family, juggling different levels of homeschooling can at times be a challenge. One of my long-term goals is for each child to become a completely independent learner, to be able to educate themselves in any way necessary to equip them for their future careers and life. Once each child is an independent reader, this becomes much easier and it is therefore the children in the 4 to 6-ish bracket that receive the most one-on-one parent directed teaching as they learn their basic phonics, reading and mathematic skills. As they progress through the next couple of years or so and become proficient readers, they begin to work more and more independently. 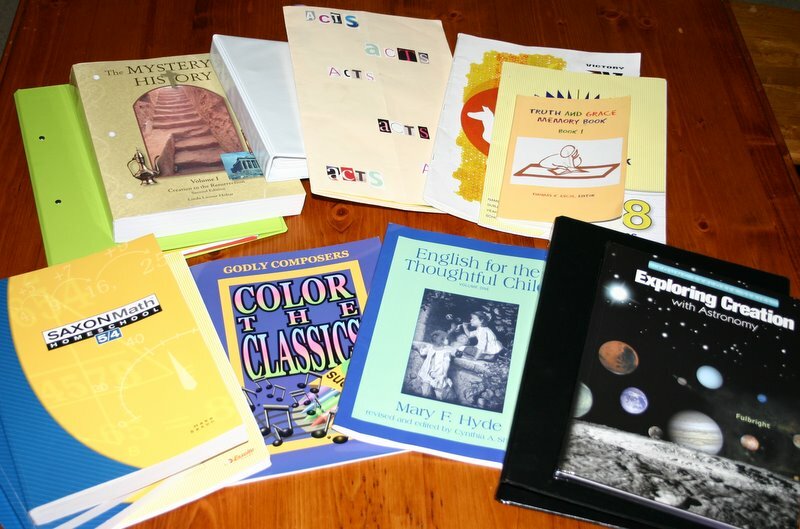 This kind of system is great for all children and is particularly helpful for those who like to know what is coming next, those who tend to argue or complain about what they do or do not have to do for the day and those who waste a lot of time finding books and supplies instead of working. Everything is black and white and dictated by the drawers. You are not finished until the last drawer is done. They can even include music practice, computer time, chores or any other kind of task a child is responsible for in a day. I love the idea of workboxes set out in this way but didn’t want to have to swap out activities on a nightly basis. 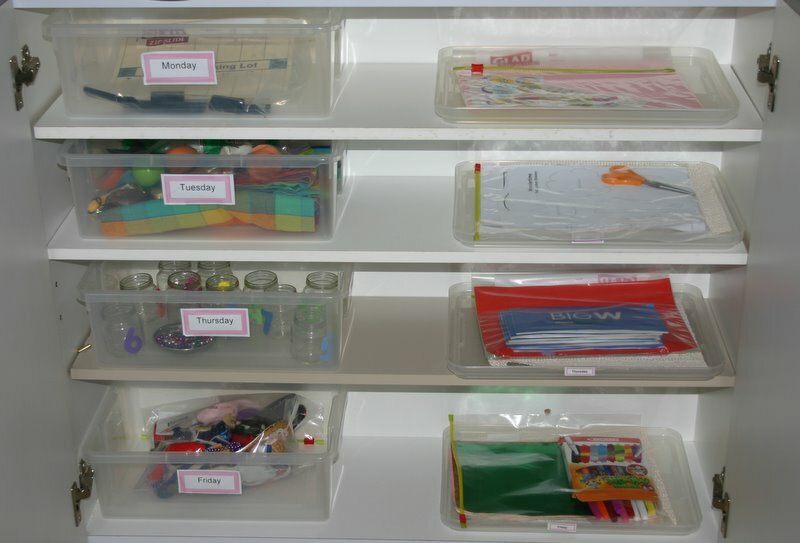 While the year one child for example does reading and phonics every day, they do not do exactly the same activity so the drawer system would require me swapping out the phonics drawer every night. The same applies for maths which is a daily activity, however the form that it takes changes daily. Miss 3 1/2 year old’s cupboard – 1 workbox and 1 tray per day. Miss 6 year old’s shelf – 1 workbox per day. In the end I took the basic idea of the workbox (that is every piece of equipment necessary and every activity needing to be completed throughout the day is in the box) and tweaked it to fit our family. Our workboxes are simply a plastic crate containing every activity that must be completed throughout the day for each child within the one box (or in some cases a box and a tray for each day.) There is a box for each day of the week, apart from Wednesdays when our eldest son attends a homeschooling co-op and the girls have a more relaxed day of craft and cooking etc. I set them up at the beginning of the term and only need to change them when content such as reading books need to be updated, rather than on a daily or weekly basis. For those of you who are interested, here is what’s in the boxes. Tuesday: Letterland phonics, counting workjob, puzzle and colouring in. Thursday: Montessori style tong activity, book, counting workjob, pattern blocks and puzzle cards. Friday: counting workjob, Montessori style spooning activity, diary writing and puzzles. Monday: Reading, 3 letter words spelling book, addition workjob, phonics & spelling starter styles and Montessori sight words picture match. Tuesday: reading, handwriting, Montessori sight words picture match, phonics digraphs, number starter styles and subtraction workjob. Thursday: Diary writing, Montessori sight words picture match, number starter styles, reading and geoboard activities. Friday: Reading, calculations starter styles, Montessori sight words picture match, sight words activity book and base 10 activities. He uses a mixture of Saxon Maths and Maths-U-See, Mystery of History, Exploring Creation, copywork, lapbook activities, Color the Classics and English for the Thoughtful Child. We all have circle time together, with the focus on bible reading, character training, scripture memorization, catechism and prayer. I spend time with Miss 3 1/2 while Master 8 and Miss 6 work independently, then one-on-one with Miss 6 while the others work independently and finally time with Master 8 while both girls finish off their activities and head outside. This is what is working for us at the moment, although as life changes and new challenges appear (such as the twins dropping their morning nap sometime soon! ), everything changes again. But that’s life with little ones!